Learn about all the changes that occurred last week. 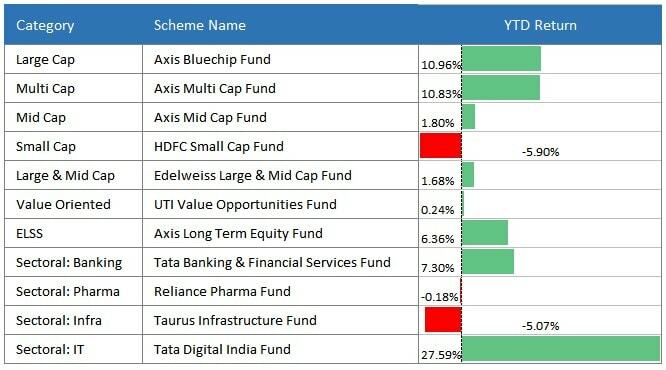 Mutual fund market is full of uncertainties; sometimes, the whether here is stormy, sometimes it is rainy, whereas during the other days, the sky is clear. 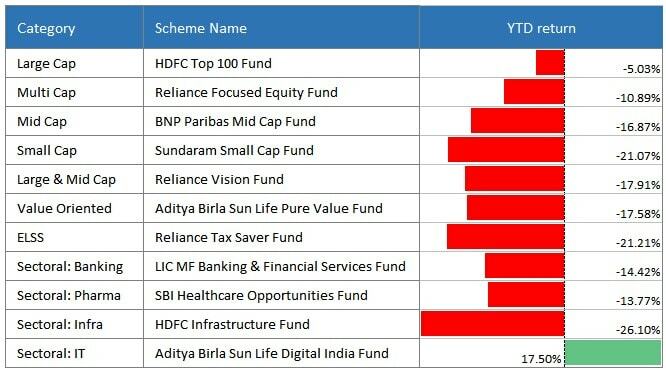 With the same view in mind, we have come up with this detailed summary of all the big-small events that created a buzz in the MF market. So without any ado, let’s get started! Since past 6 months, this week, S&P BSE Sensex has registered the largest return of 2.48% closed at 36541.63. In intraday trade on Thursday, it has scaled a new record high of 36740.07 due to falling oil prices and firmly global cues. 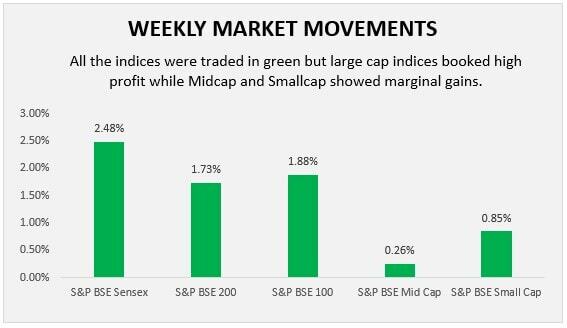 Other large cap indices, S&P BSE 100 and S&P BSE 200 were traded at weekly gain of 1.73% and 1.88%, respectively. However, S&P BSE Mid Cap and S&P BSE Small Cap rose just by 0.26% and 0.85%. In the opening days, strong US job data, strengthened rupee value, and optimism towards corporate earnings added gains to the market. On Wednesday, one of the major IT bellwethers, TCS touched an all-time high at a price of Rs. 1995 and booked 5.5% return after release of its corporate earnings for 1st quarter which reported unexpected growth of 4.8% year-on-year profit growth. However, gains were restricted due to possible tariff threats of 10% on additional import of Chinese goods worth $200 billion. By the end of the week, improved Indian GDP data ahead of France supported investors’ sentiments and brought India to the world’s 6th largest economy. 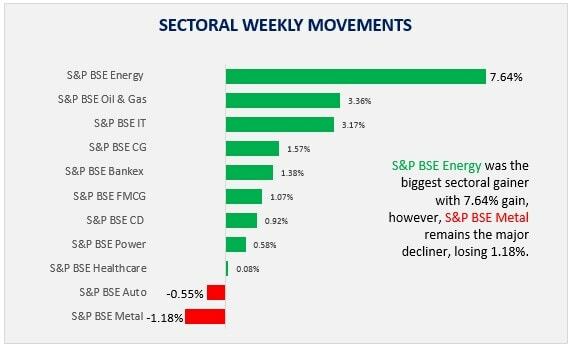 On BSE sectoral note, 9 out of 11 sectors closed in green, among all, S&P BSE energy and S&P BSE oil & gas booked maximum weekly return of 7.64% and 3.36%, respectively. It is because of OPEC and Russia’s promise to increase oil production resultant decline in oil prices. Rally in IT stocks moved market up by 3.17%. Buying pressure in consumer goods, Bankex, FMCG, consumer durables, power, and healthcare added weekly return of 1.57%, 1.38%, 1.07%, 0.92%, 0.58%, and 0.08%, respectively. Only 2 sectors, S&P BSE Auto and S&P BSE metal were traded in red. S&P BSE Metal dived by 1.18% due to the US-China trade fears. However, S&P BSE auto fell by 0.55% at year-to-date loss of 16.09%. Cyclical market fluctuations, regulatory uncertainty on diesel, Brexit, and lower diesel demand were the reasons behind decline in auto sector. With a bit of upsurge in the mutual fund market, there was a sense of relief for the investors concerning the conditions this week. There was a positive market mood and investors were happy about the running scenario. However, things are never constant in the mutual fund world, and it’ll always remains a roller-coaster ride. To enjoy the best of it, stay invested with the guidance of the best industry experts. Connect us to clear your doubts about SIP investments, investment in any scheme, or any other. It’s time we bid adieu to what has happened and extract the vital learning. Stay tuned with us to get the updates of the current week.